Movies like “Jaw” generated panic when they fist showed up. Over time, we were given a pretty brutal image of sharks. Now we get to see the opposite is possible too. Meet Florence, the world’s first vegetarian shark! 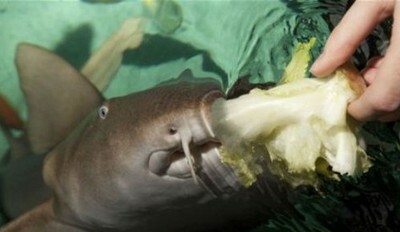 It is common knowledge by now: sharks would eat just about anything. There are accounts of sharks enjoying car parts such as license plates and tires and all sort of garbage. The diet of one of the most feared predators on the planet has some items on the menu that are well more unusual than “Bizarre Foods” with Andrew Zimmern. In England, there is a shark that would happily chew on lettuce leaves than fish. Meet Florence, the world’s first vegetarian shark. Somehow this shark turned from carnivore to vegetarian. The trigger behind this transition might be more common than you’d imagine. The six-foot-long shark named Florence underwent surgery over an injury caused by a fishing hook. During the surgery to remove the fishing hook from her mouth, the experts put in practice state of the art techniques. Not only was Florence the first shark to ever survive such a procedure, but in no time she got to be the world’s first vegetarian shark. The zoo site reads: “Three years ago, when Florence arrived at the National Sea Life Centre from Florida, her caretakers discovered that she had a fishing hook lodged deep inside her mouth”. Florence had to undertake “a groundbreaking out-of-water surgery, making her the first shark to survive such an operation”. The story says that soon after Florence recovered from the risky surgery, caretakers noticed she refused to eat meat. Florence’s new eating habits first puzzled the caretakers as it was unprecedented. “But after Florence healed up, she didn’t return to her protein-rich diet. When her keepers offer her fish, she refuses to eat, instead stealing vegetables meant for her green turtle roommate”. Florence is a nurse shark and experts say there have been some accounts of other sharks in her species occasionally preying on algae. But never to the extent of fully saying no to meat. “A nurse shark eating the occasional bit of algae isn’t unusual, but for a shark to turn down meat entirely is unheard of” reads the website. Apparently, this is one shark that will find preying on algae more appealing than seals!